The produce section is my favorite section of the grocery store. Even more than that, I love a good farmer's market. Seeing all the beautiful fruits and veggies that are in season always spark my imagination and allow me to think up new ways to use fresh ingredients. 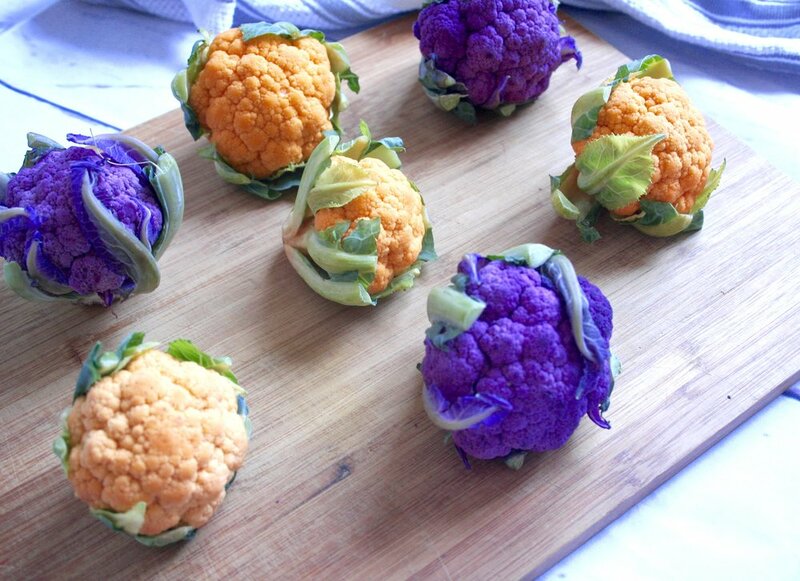 On a recent grocery run, I literally stopped dead in my tracks when I came across some gorgeous bright orange and purple cauliflower. I had to have them. After loading up my basket, I started to think through how I was going to use them. Certainly throwing them raw into a salad would have been just fine, but I wanted something a little more hearty and savory. I decided to grab some black beluga lentils and golden raisins with the idea that I'd roast the cauliflower seasoned with curry. Some goat cheese crumbles for creaminess and fresh parsley for freshness would finish things off nicely I thought. I did. Preheat oven to 375 degrees. Remove stems and chop all of the cauliflower into bite size pieces. In a both, toss the cauliflower with 2 Tbs of the olive oil and 1 Tbs of the curry powder. Season generously with salt and pepper. Spread out the cauliflower on a baking sheet in a single layer, and roast in the oven for about 20 minutes, tossing half way. Remove and cool. Fill a medium size pot half way with water and bring to a boil. Add some salt (about a TBS) and throw in the lentils. Simmer on low heat until lentils are tender, about 30 minutes. Drain the lentils and transfer to a bowl to cool. While the lentils and cauliflower cool, prepare the remaining ingredients. Make the dressing by combining the remaining 2 Tbs of olive oil with the remaining 1/4 tsp of curry powder and the 2 Tbs of white wine vinegar. Season with salt and pepper and whisk until incorporated. Add the cauliflower to the bowl with the lentils and toss with the dressing. Finish by adding in the parsley, golden raisins and goat cheese (exclude for vegan version).